The Union Pacific's M-10000 essentially ushered in a new era of passenger rail travel in this country; fast, sleek, and ultra-comfortable streamlined trains that spared no expense in dazzling its riders and making them trip unforgettable. While neither it nor the Burlington's Burlington Zephyr (as it was originally known) offered the very first streamlined trains (a concept that dated back to the early 20th century) they most certainly perfected it for use in main line applications with the traits mentioned above. 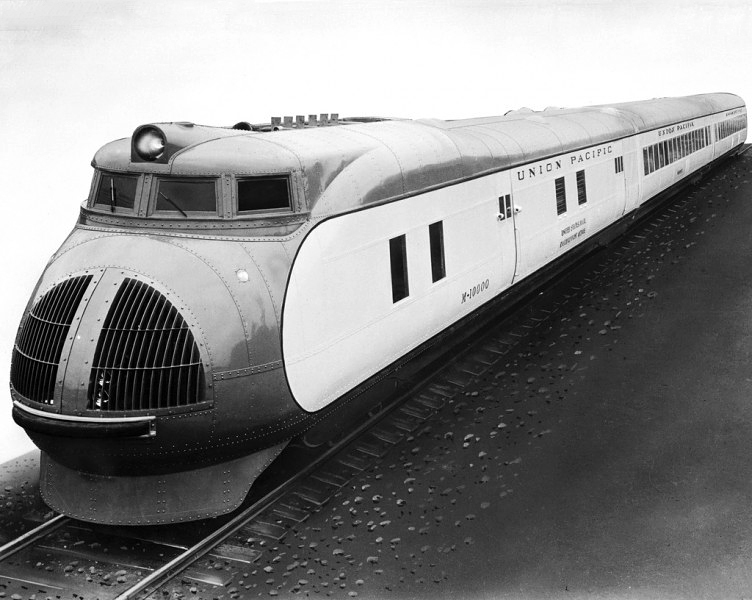 Union Pacific's streamlined trainset proved successful from the standpoint of publicity but it was not built nearly as well as the CB&Q's design. It also used a prime mover that was not really suited for heavy railroad use. In the end, while the M-10000 kicked off the streamliner craze it and its sister trainset the M-10001 saw a short service life of less than 10 years. The idea for Union Pacific to launch a revolutionary new type of passenger train was thanks to its then president Averell Harriman, who used the idea of his father Edward (UP's noted president of the 19th and early 20th centuries). From the start of the 20th century E.H. Harriman was looking for ways to reduce expenses of running passenger trains and one way in which he did this was by purchasing more than 100 McKeen car from the McKeen Motor Car Company beginning in 1905. These cars were primarily powered by a gasoline engine and somewhat resembled the classic "Doodlebug" cars of the 1920s. The McKeens featured a somewhat streamlined design with a "wind-splitter" aerodynamic lead nose. However, overall the car was not very successful, primarily because a reliable prime mover was not available. Using this concept, Averell approached Pullman-Standard about developing an articulated trainset of three cars with a sleek carbody that had never been used on rails before. For power, the Union Pacific contacted the Winton Engine Company about developing a prime mover to be used for the train. Winton, even by that time, was the early pioneer in building engines for use in railroad applications. However, because UP was distrustful of early diesel engine technology it asked that the prime mover be a gasoline-powered distillate engine instead. What Winton came up with was a 600 horsepower engine although it would later prove to be a poor performer in regular main line service. As it were the M-10000 was delivered officially to the Union Pacific on February 25, 1934, not quite two months before the Chicago, Burlington & Qunicy's Burlington Zephyr (later known as the Pioneer Zephyr) was unveiled to the public in Philadelphia. Pullman-Standard had used aluminum to construct the carbody making it an ultra lightweight trainset at just 124 tons (about the same weight as one P-S heavyweight sleeping car). The train was 204 feet in length with the power car and its bulbous, turret-like cab doubling as a Railway Post Office (RPO) and baggage compartment capable of handling 25,000 pounds of mail. The second car was a standard coach capable of holding 50 passengers and the third, a round-ended-like buffet-kitchen car (while it looked like an observation there was no rear seating and open glass to see the passing countryside). 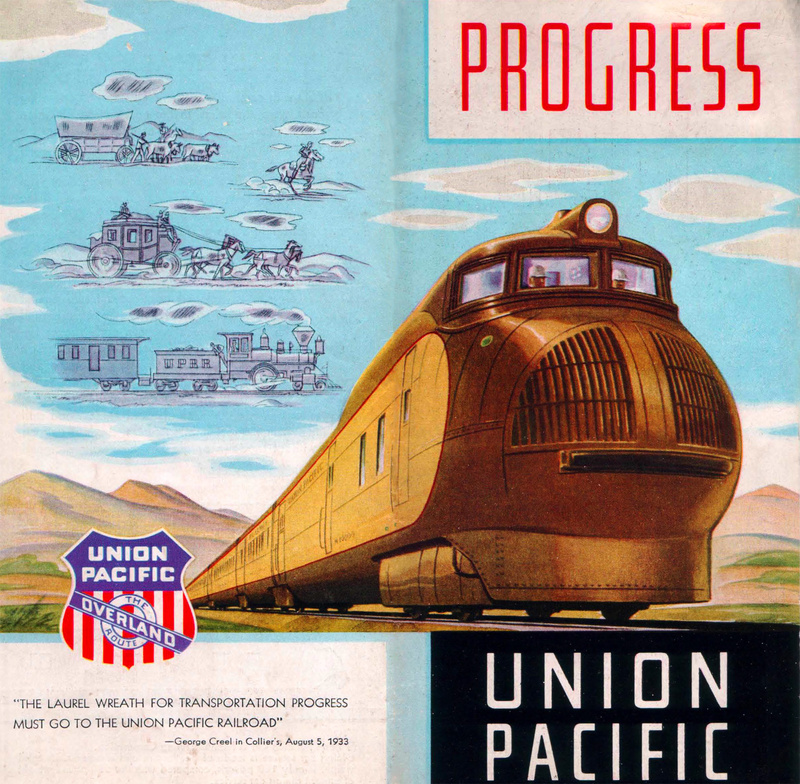 Union Pacific dubbed the train simply The Streamliner and referred to it as "Tomorrow's Train Today!" The articulated trainset certainly wowed the public, which was even more impressed by its interior air conditioning and speeds reaching 110 mph. Perhaps what was most interesting about the train, at least from a historical perspective was the livery it chose of dark "canary yellow" and brown. This paint scheme was essentially the foundation of Union Pacific's own adopted livery of Armour yellow but its purpose of being applied to the trainset was for safety reasons so as pedestrians and motorists could easily spot the train and avoid a collision. Like the Burlington's Pioneer Zephyr the M-10000 made a publicity tour touting its speed, clipping more than 100 mph on a 24-hour schedule between Chicago and Los Angeles. 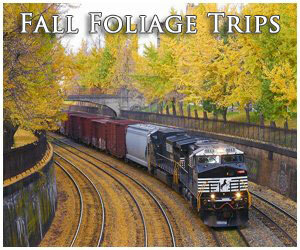 The train entered regular service on January 31, 1935 also as a regional run like the Zephyr. 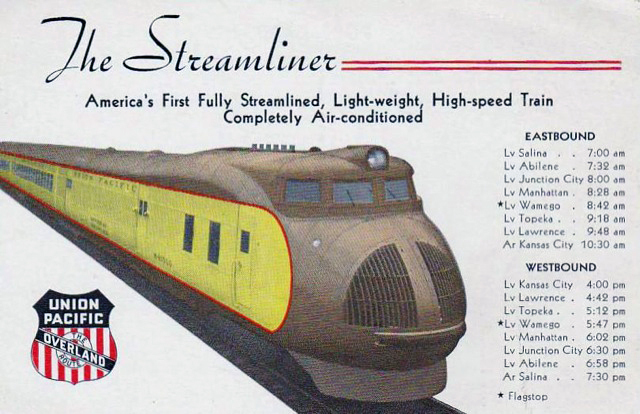 It should also be noted that Union Pacific believed in its new streamliner so much that it ordered a second trainset in the fall of 1934, the M-10001, even before it took delivery of the original set. 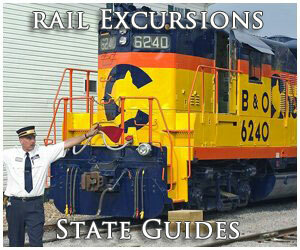 For more reading about the train please click here. This train was much larger featuring a baggage-dormitory, three sleepers, and a coach-buffet. 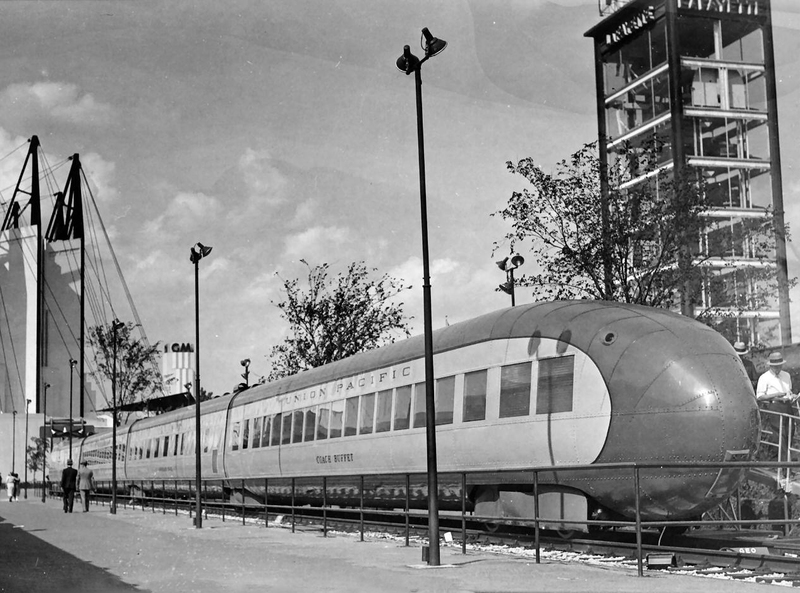 Due to the success Burlington's streamliner was having Union Pacific sent the M-10001 on its own country-wide tour making a headline-grabbing and record-breaking 38-hour and 50-minute run between Los Angeles, Chicago, and New York. Unlike the Zephyr trainsets Union Pacific's streamliners proved to be not practically useful for the every day rigors of railroad use. For instance, the Zephyr's stainless steel was much more durable than the aluminum sheathed trainset and the distillate prime mover was likewise not well adapted for regular use. As such, the train was pulled from service and scrapped in 1940 after just six years of service. During its time in operation the M-10000 was renamed as the City Of Salina running daily between Kansas City and Salina, Kansas. This corridor was less than 200 miles in length and was lightly populated resulting in low ridership.